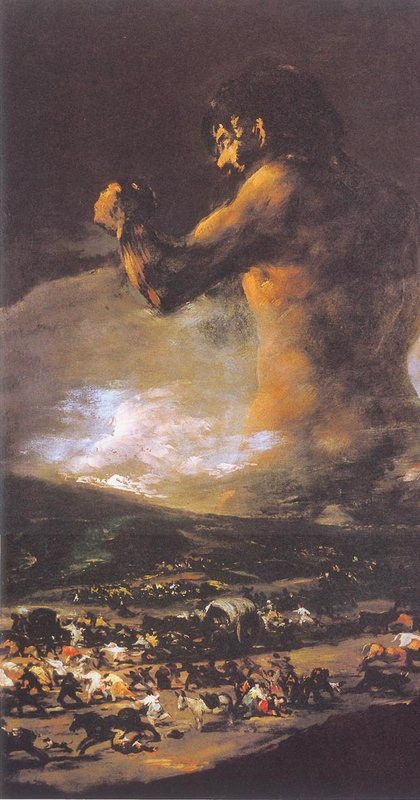 The Colossus, painted early in the 19th Century, is traditionally attributed to Francisco Jose de Goya. But museum experts now say that an investigation has revealed new information about the possible artist. The revelations follow the identification of two initials - AJ - at the bottom of the canvas. 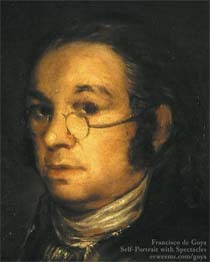 According to the Prado's investigators, those initials link the work to Asensio Juli, a friend and collaborator of Goya. The painting depicts a giant walking through a landscape as people flee in panic. The style of the Colossus was thought to be connected to paintings by the artist about Spain's war of independence against the French. But, on the basis of their ongoing investigation, the Prado's specialists say they refute the view that Goya is the painter. The question with Goya is that if he didn't paint works like The Colossus, the New York Majas, or the Black Paintings, then we have to find a new artist as their author. If there were such an anonymous artist who for various reasons wanted to keep their identity a secret, then it's a challenge to find out who they were. I know some people have suggested Javier Goya, but I don't believe that. ... in an announcement set to raise a storm in the art world, the museum said yesterday that the celebrated El Coloso was not by the Spanish master after all, and was probably painted by a pupil in his studio. In a devastating critique, the museum's chief Goya specialist said the painting, made during Napoleon's occupation of Spain after 1808 and long seen as one of the artist's most dramatic portrayals of the horrors of war, was "a pastiche". "Stylistically, it is completely alien to Goya," said Manuela Mena, the Prado's senior Goya specialist who has studied El Coloso and doubts over its attribution for nearly 20 years. She also revealed doubts over at least three other Goyas held by the Prado. ..."The person who painted the bulls in El Coloso knew nothing about the anatomy of a bull – which Goya knew everything about," Ms Mena said. "The donkey looks like a furry toy, nothing like Goya's perfectly executed donkeys of the same period. None of the details correspond to the Goya we know."